'In My Feelings Challenge': Is daughter of Bollywood actor Drake's Kiki? Athiya Shetty, daughter of Bollywood actor Sunil Shetty, was called legend by Drake, a Canadian singer, on Instagram, sparking curiosity among fans as to how they can possibly know each other. 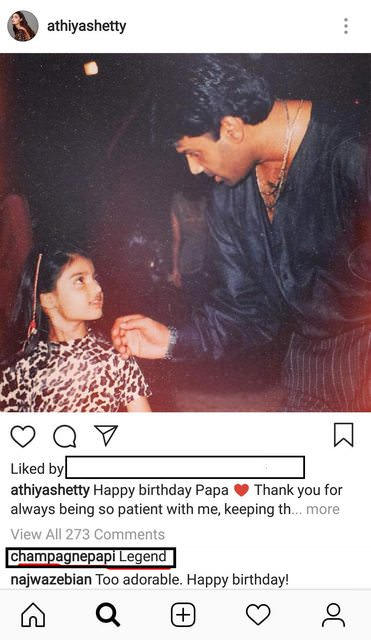 Story is that Athiya, also a Bollywood actor, used her Instagram account to wish her dad on his birthday and "In My Feelings" singer wrote "legend" in comments on the post, sparking speculations with many users wondering about the relationship between the two. It latter turned out that Drake and Athiya follow each other on social media. According to an Indian broadcaster Athiya and Drake became friends when they met in London. Athiya was reportedly vacationing in London when she met Drake. Aubrey Drake Graham is a Canadian rapper, singer and songwriter. He is regarded as one of the most popular entertainers in the world, and one of the best-selling music artists of the 21st century. Drake captured yet another number-one hit with "In My Feelings" on July 21, which also spawned the viral "#InMyFeelingsChallenge" or "#KiKiChallenge". Many people attempting a viral dance were reportedly injured in different countries, prompting the police across the world to warm citizens against doing the "Kiki challenge" last month. Also known as "In My Feelings challenge", the Kiki challenge involves jumping out of moving car and dancing alongside it to Drake's hit "In My Feelings" while the car continues moving.